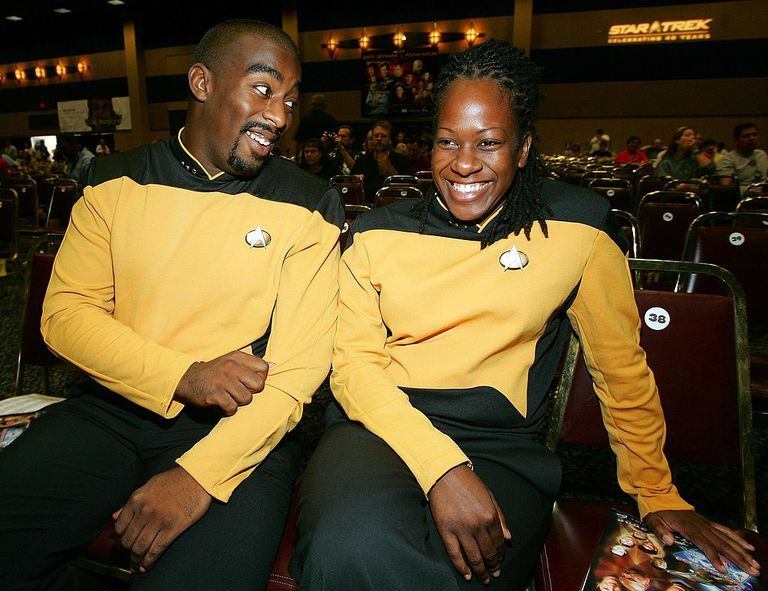 Star Trek costumes are original in that they are almost all uniforms. While the uniforms from the later series and movies can get complicated, Starfleet kept the designs relatively simple in the original television series and they are easy to make. Geek Disclaimer: Keep in mind that these are simple costumes, and are not intended to be exact replicas. If you plan to wear it to a convention where people will be nitpicking, you may have to pay more attention to detail. But for a Halloween party, these suggestions should be fine. Early Star Trek uniforms for men were simple. You won't have to add much in the way of decoration to plain gold, blue, or red long-sleeved shirts. Insignia: The Star Fleet patch on the front of the uniform is vital. Without it, you'll just look like some guy in his pajamas. Create a stencil to spray paint or stitch your design onto gold fabric, then apply the fabric as a patch. The shirt: You'll want to find a white long-sleeved t-shirt. Use cheap RIT or Dylon dye to get it the right gold, blue or red color, depending on who you are portraying. Underneath this shirt, wear a black t-shirt that has a smaller collar than the dyed shirt. If you feel the need to sew one accurate to the series, you can buy a pattern at Roddenberry.com. You can also make and attach your own sleeves. Rank braids: These are the goofy looking gold ric-rac at the ends of the uniform sleeves. You can get gold ric-rac in the ribbon section of any craft store. You'll need three on each arm if you're a captain, but lesser-ranking officers have two or one. The pants and shoes: Black slacks will work fine. You should wear black boots with smooth soles to be accurate, high enough to blouse the slacks. It's hard to imagine women actually getting work done in their early Starfleet miniskirt uniforms. The dress: The female uniform is little more than a low-cut version of the man's shirt. A pattern used to be sold at Roddenberry.com but is no longer available. You may be able to search for a Star Trek dress pattern online. You could save some time and money by converting an existing dress into a uniform. Cut the bottom off of a plain, well-fitting dress that doesn't have any embellishments like beads or embroidery. Make it as short as you dare. Use the extra fabric to then make matching long sleeves for your uniform. Add rank braids to your wrists just as described in the male uniform above. The boots: Knee-high black boots are a must for Starfleet women. Why these are functional to the work of a communications specialist or an onboard doctor, I'll never know.